Couldn't find astronomy-thread so might use this thread for extraterrestrial news . Just thought some might find it fun to read of other scientics than those related to climate. Similar threads for genetics, archeology, inorganic chemistry, medicine could be made here. The threads for science that is little to none related to climate change, that is. The wolf-rayet thread can be deleted so it won't be a single post thread. We can either go with multiple threads or change the thread title to something more general and keep it in one thread. I think Neven should pick because it is his site. Between Earth and the galactic core, there's an old, faint star that appears to have something orbiting it, something that's confusing astronomers. Astronomers first noticed VVV-WIT-07's odd periodic flickering during a 2012 survey of the inner Milky Way using the VISTA telescope in Chile. Now they're reporting their find, without being all that sure of what's causing it. In 2012, VVV-WIT-07's amplitude was found to dim slowly for around 11 days, and then rapidly fade to next to nothing over the next 48 days. The eclipse blocked a whopping 80 percent of the measured light, providing the astronomers with a real mystery. None of the usual explanations accounted for the eclipse. The media attention might well come in handy, but Boyajian dismisses notions that alien ingenuity might be behind it. "The new data shows that different colours of light are being blocked at different intensities," she said recently. "Therefore, whatever is passing between us and the star is not opaque, as would be expected from a planet or alien megastructure." That could mean it's a megastructure with tinted windows. Or maybe it's just time to let the idea go. Sorry. BTW i like the last cited bit. I really dislike the idea of advanced alien societies building Dyson spheres. Changing light densities may indicate light being reflected by rings of ice crystals (similar to Saturn but much larger) prior to passage of a large gas giant 2-3 times the size of Jupiter. Another possibility is a binary system with one of them being a young dim star. Taking gravity, tilt, rotational speed, mass ... etc into account. Lots and lots of possibilities. One of the oldest stars found. According to some theories old stars were massive and short-lived, this star is way smaller than most population III stars yet found, so it presents some problems for some models of the early universe. pmt, thanks for starting this thread and keeping us updated. It's not ASI or geophysical sciences, but it's interesting. Big universe, I found a figure for the observable universe volume as roughly 4×10^32 cubic light-years. Also a cubic light year is is a cube that is 10 trillion kilometers on each side. That is 8.23x10^38 cubic kilometers. Isn't the universe a dark place. Dr Farnes suggests that both dark energy and dark matter are a fluid that possess "negative mass". That means in effect that it would be the inversion of normal mass: if you pushed it, it would be propelled towards you. "We now think that both dark matter and dark energy can be unified into a fluid which possesses a type of 'negative gravity', repelling all other material around them," said Dr Farnes. "Although this matter is peculiar to us, it suggests that our cosmos is symmetrical in both positive and negative qualities." That proposed fluid appears to work exactly as dark energy does. "The outcome seems rather beautiful: dark energy and dark matter can be unified into a single substance, with both effects being simply explainable as positive mass matter surfing on a sea of negative masses," he said. Not sure if this will work but it would be nice to fill in the darks. Add this to the Black Sea Deluge Hypothesis for scientific support of biblical myths. Archaeologists have been digging at the Tall el-Hamman site for 13 years, and have unearthed some pretty convincing evidence supporting the air-burst idea. The findings were presented on November 15th at the annual meeting of the American Schools of Oriental Research, by archaeologist Phillip Silvia of Trinity Southwest University. Tall el-Hammam was a thriving city state occupying Middle Ghor. The civilization had occupied the area for over 2,500 years. The city itself held the administrative center of the kingdom, and was protected by a perimeter wall up to 30m (100 ft) thick and up to 15m (50 ft.) high, for a linear distance of over 2.5km. The wall held multiple gates, towers, and likely other defensive features. 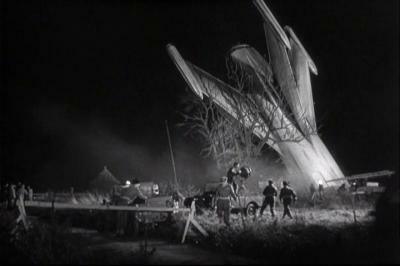 But all that was obliterated when the meteor pierced the atmosphere and exploded over the area. Evidence gathered at the Tall el-Hammam site tells the story of the event. When the meteor air-burst occurred, there was an intensely hot and powerful shock wave. The shock wave wiped out all settlements in the area and destroyed an area of 500 sq. km. And the area remained uninhabited for a remarkable 700 years after the event. Several lines of evidence support the likelihood of this event. Silvia and Collins say in their paper that the destruction and the damage on walls and other structures in the city is directional, supporting the idea of a shock wave. In the past, archaeologist have wondered if an earthquake could have caused the collapse of the region, but an earthquake would not have caused the type of directional damage that the remaining structures and fortifications display. A pottery shard was found in the city that had one side melted to glass. Only extreme heat can do that. Examination revealed zircon crystals inside a bubble in the glass which could only have been formed by temperatures over 4000 Celsius. Additionally, the layer of melted clay that turned to glass is only 1 mm, not the entire depth of the shard. This indicates only a short burst of intense heat, rather than long exposure from something like burning petro-chemical eruptions. The research team concluded that the shard was exposed to temperatures between 8,000°C and 12,000°C for less than a few milliseconds. That certainly supports the idea of an airburst. Researchers at the site also found what's called a "melt rock" weighing over 600 grams. It's an agglomeration of three different rocks melted together by extreme heat and covered with a layer of glass. This also contained zirconium crystals, and further analysis of the melt rock concluded that it had probably been exposed to 12,000 degree Celsius temperatures for a few seconds. The final piece of evidence concerns what happened to the Tall el-Hammam area after the destruction. This region is considered the best-watered agricultural area in the region, yet after the Tall el-Hammam city-state was destroyed, the area remained unoccupied for about 700 years. What could have caused this, if the extreme heat from the air burst lasted only a few seconds? The answer lies in the soil, according to the researchers. Six samples from above, through, and below the soil layer from the time of the event were analyzed geochemically. The results showed "salt and sulfate levels > 6 percent (60,000 ppm) in the ash layer and > 5 percent (50,000 ppm) in the soil layers immediately above and below the ash layer," according to the paper. The source of these contaminants had to be the Dead Sea, which borders the Middle Ghor area. The two scientists say that the massive shockwave and heat wave not only destroyed the settlements, but the shock wave deposited a layer of salts onto the top soil, destroying it and making it unable to support agriculture for hundreds of years. It only takes a salt content of 12,800 ppm to prevent wheat from germinating, and a salt content of 17,900 ppm to prevent barley from growing. Those thresholds were easily exceeded. The researchers concluded that an airburst with a yield equivalent to a 10 mt nuclear warhead occurred about 1 km above northeast corner of the Dead Sea. They say this adequately explains all of the evidence gathered at Tall el-Hammam. The Bible is interesting from a historical perspective, because it sometimes interweaves actual events from history with the Christian mythology. 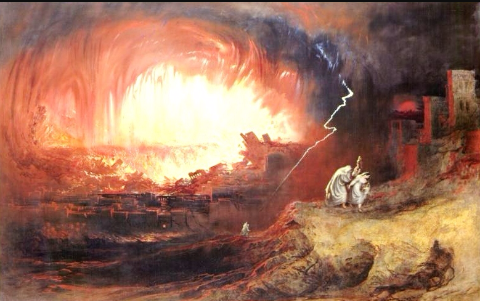 Now that it seems reasonable that a meteor airburst did destroy the area that may have contained Sodom, we can lay to rest the idea that the Christian God sent down fireballs to punish homosexuality. It looks like once again, it was a perfectly natural event that led to an apocalyptic, mythological story, and that what people once attributed to Gods and Goddesses is just nature. And maybe god was really an alien that gave Lot the heads-up about some 'incoming' heading his way. Who knows? Seems completely bonkers. Dark matter exhibits a kind of negative gravity here, repelling ordinary matter. But nevertheless moves towards normal matter, because its motion is opposite to gravity. It exerts a positive gravitational *force* on other dark matter, but direction of motion/acceleration is again opposite to that force. A theoretical dense dark matter object and ordinary object would accelerate in the same direction, without bound, by gravity. Bonkers. Yes, negative mass is a wonderful thing, we covered this example in class many decades ago. The paper lays it out quite clearly. "One of the more bizarre properties of negative mass is that which occurs in positive–negative mass particle pairs. If both masses have equal magnitude, then the particles undergo a process of runaway motion. The net mass of the particle pair is equal to zero. Consequently, the pair can eventually accelerate to a speed equal to the speed of light, c . Due to the vanishing mass, such motion is strongly subject to Brownian motion from interactions with other particles. In the alternative cases where both masses have unequal magnitudes, then either the positive or the negative mass may outpace the other – resulting in either a collision or the end of the interaction." Heeheehee. I like it. I don't believe the paper will hold, but I like it. Not knowing what 96% of the universe is made of is kind of bonkers too. In this way mass is more like the other stuff with a positive and negative side and that makes sense on the idea level. Bit hard to think about because we only live in the positive side here. PS: Nice summary by notFritz. ... There are more things in heaven and earth, Horatio, Than are dreamt of in your philosophy. University of Rochester researchers have succeeded in creating particles with negative mass in an atomically thin semiconductor, by causing it to interact with confined light in an optical microcavity. Other research groups have been experimenting with similar devices, Vamivakas says, but this is the first device to produce particles with negative mass. The research was funded by the Air Force Research Laboratory. I should note here that there are many examples of excitations which can have momentum in a different direction than (group) velocity. One famous example is rotons in liquid helium. Another is phonons in a crystal. But that takes us rather far afield. Voyager 2 has exited heliosphere, reports NASA. The interstellar probe no longer observes the solar wind. Still, it's a very long way away from the gravitational borders of Sol System. The 41 years old, still working, instrument, that measures the energy and direction of the plasma particles hitting it, has noted the expected change in the direction as the galactic winds of particles start to hit it. The effects of such a supernova—and possibly more than one—on large ocean life are detailed in a paper just published in Astrobiology. A supernova 2.6 million years ago may be related to a marine megafaunal extinction at the Pliocene-Pleistocene boundary where 36 percent of the genera were estimated to become extinct. The extinction was concentrated in coastal waters, where larger organisms would catch a greater radiation dose from the muons. "As far back as the mid-1990s, people said, 'Hey, look for iron-60. It's a telltale because there's no other way for it to get to Earth but from a supernova.' Because iron-60 is radioactive, if it was formed with the Earth it would be long gone by now. So, it had to have been rained down on us. There's some debate about whether there was only one supernova really nearby or a whole chain of them. I kind of favor a combo of the two—a big chain with one that was unusually powerful and close. If you look at iron-60 residue, there's a huge spike 2.6 million years ago, but there's excess scattered clear back 10 million years." Melott said cancer and mutations would be the most obvious consequences for Earth's biology of a supernova's cosmic rays. "There isn't a mass extinction, but there is kind of a lot of extinction going on at that time and species turnover," he said. "It's not quite severe enough to call it a mass extinction." Adrian L. Melott et al, Hypothesis: Muon Radiation Dose and Marine Megafaunal Extinction at the End-Pliocene Supernova, Astrobiology (2018). According to the team, other evidence for a series of supernovae is found in the very architecture of the local universe. "We have the Local Bubble in the interstellar medium," Melott said. "We're right on its edge. It's a giant region about 300 light years long. It's basically very hot, very low-density gas—nearly all the gas clouds have been swept out of it. The best way to manufacture a bubble like that is a whole bunch of supernovae blows it bigger and bigger, and that seems to fit well with idea of a chain. When we do calculations, they're based on the idea that one supernova that goes off, and its energy sweeps by Earth, and it's over. But with the Local Bubble, the cosmic rays kind of bounce off the sides, and the cosmic-ray bath would last 10,000 to 100,000 years. This way, you could imagine a whole series of these things feeding more and more cosmic rays into the Local Bubble and giving us cosmic rays for millions of years." The stunning Korolev crater in the northern lowlands of Mars is filled with ice all year round owing to a trapped layer of cold Martian air that keeps the water frozen. The 50-mile-wide crater contains 530 cubic miles of water ice, as much as Great Bear Lake in northern Canada, and in the centre of the crater the ice is more than a mile thick. Their paper, published in the Astronomical Journal, describes the planet as about five to 10 times as massive as the Earth. ... They have inferred its existence from the motion of recently discovered dwarf planets and other small objects in the outer solar system. Those smaller bodies have orbits that appear to be influenced by the gravity of a hidden planet – a "massive perturber." The astronomers suggest it might have been flung into deep space long ago by the gravitational force of Jupiter or Saturn. ... Brown notes that the putative ninth planet—at 5,000 times the mass of Pluto—is sufficiently large that there should be no debate about whether it is a true planet. Unlike the class of smaller objects now known as dwarf planets, Planet Nine gravitationally dominates its neighborhood of the solar system. In fact, it dominates a region larger than any of the other known planets—a fact that Brown says makes it "the most planet-y of the planets in the whole solar." Batygin and Brown realized that the six most distant objects from Trujillo and Shepherd's original collection all follow elliptical orbits that point in the same direction in physical space. That is particularly surprising because the outermost points of their orbits move around the solar system, and they travel at different rates. "It's almost like having six hands on a clock all moving at different rates, and when you happen to look up, they're all in exactly the same place," says Brown. The odds of having that happen are something like 1 in 100, he says. But on top of that, the orbits of the six objects are also all tilted in the same way—pointing about 30 degrees downward in the same direction relative to the plane of the eight known planets. The probability of that happening is about 0.007 percent. "Basically it shouldn't happen randomly," Brown says. "So we thought something else must be shaping these orbits." After examining the orbital periods of these six Kuiper Belt Objects (KBOs) – Sedna, 2010 GB174, 2004 VN112, 2012 VP113, and 2013 GP136 – they concluded that a hypothetical planet with an orbital period of about 17,117 years (or a semimajor axis of about 665 AU), would have the necessary period ratios with these four objects. This would fall within the parameters estimated by Batygin and Brown for the planet's orbital period (10,000 – 20,000 years). Their analysis also offered suggestions as to what kind of resonance the planet has with the KBOs in question. Whereas Sedna's orbital period would have a 3:2 resonance with the planet, 2010 GB174 would be in a 5:2 resonance, 2994 VN112 in a 3:1, 2004 VP113 in 4:1, and 2013 GP136 in 9:1. These sort of resonances are simply not likely without the presence of a larger planet. "For a resonance to be dynamically meaningful in the outer Solar System, you need one of the objects to have enough mass to have a reasonably strong gravitational effect on the other," said the research team. "The extreme Kuiper belt objects aren't really massive enough to be in resonances with each other, but the fact that their orbital periods fall along simple ratios might mean that they each are in resonance with a massive, unseen object." Estimates of Planet Nine’s “possible” and “probable” zones. by French scientists based on a careful study of Saturn’s orbit and using mathematical models. ... “For me candidate Planet Nine is a close object, although it is about 700 times further away as the distance between the Earth and the Sun,” noted Linder in a statement. The “ideal” Planet Nine, according to the models, features a mass ten times heavier than Earth, and a radius 3.7 times wider than our planet. Similar to Uranus and Neptune, it has an outer envelope of helium and hydrogen, a layer of gas (also consisting of helium and hydrogen), a water ice layer, a silicate mantle, and an iron core. The models also projected a temperature of 47 Kelvin (-374 degrees Fahrenheit, -226 degrees Celsius). Planet Nine is bitterly cold—but this data suggests that it’s being heated from the inside. Was Planet Nine Captured By The Sun During The Cluster Phase? "It is almost ironic that while astronomers often find exoplanets hundreds of light years away in other solar systems, there's probably one hiding in our own backyard", says Alexander Mustill, astronomer at Lund University. Stars are born in clusters and often pass by one another. It is during these encounters that a star can "steal" one or more planets in orbit around another star. This is probably what happened when our own sun captured Planet 9. "Planet 9 may very well have been 'shoved' by other planets, and when it ended up in an orbit that was too wide around its own star, our sun may have taken the opportunity to steal and capture Planet 9 from its original star. When the sun later departed from the stellar cluster in which it was born, Planet 9 was stuck in an orbit around the sun", says Alexander Mustill. "This is the only exoplanet that we, realistically, would be able to reach using a space probe", he says. Alexander J. Mustill et al. Is there an exoplanet in the Solar system?, Monthly Notices of the Royal Astronomical Society: Letters (2016). Over four billion years ago, our sun stole hundreds of frozen mini-planets from a passing star – and the peculiar planetoid Sedna is one of them. With its extremely elongated orbit taking it 200 times further from the sun than Neptune every 11,400 years, Sedna has been a mystery ever since its discovery in 2003. Its nearest neighbours, the thousand-plus “ice dwarfs” that populate the Kuiper belt beyond Neptune, are believed to be the frozen remnants of our solar system’s formation. But Sedna, and a dozen other objects with similarly wonky orbits, are harder to explain. A gravitational kick from a planet in our solar system could never have thrown them into such orbits. One idea was that Sedna could have been jolted out of place by a passing star, but there was little evidence to back it up. ... Using a low-cost, custom-built supercomputer, the team simulated over 10,000 possible encounters to find out which combination of a star’s mass, fly-by distance and velocity would lead to ice dwarfs being gravitationally captured into Sedna-like orbits. They conclude that the passing star would have been 80 per cent more massive than the sun, and that it came as close as 34 billion kilometres – 51 times Neptune’s distance. The encounter probably took place when the sun was very young and still a member of a newly born star cluster. The passing star would itself have stolen hundreds of ice dwarfs from the sun’s Kuiper belt, and flung hundreds more into interstellar space. Scott Kenyon of the Harvard-Smithsonian Center for Astrophysics in Cambridge, Massachusetts, who together with Ben Bromley of the University of Utah in Salt Lake City was one of the first to propose the idea, says the simulations are “pretty convincing”. We are entering the greatest era of discovery in human history, an age of exploration that the thousands of Kepler planets, both confirmed and candidate, only hint at. Want to work for NASA from the comforts of your couch? The space agency is looking to fulfill an amateur astronomer's dream — credit for the discovery of a new planet. NASA is looking for help to find the mysterious and as-yet undiscovered Planet 9, which astronomers think may be the most distant planet in our solar system. A new website — Backyard Worlds: Planet 9 — lets people comb through footage captured by the agency's Wide-field Infrared Survey Explorer (WISE) mission a few years ago. The footage shows objects gradually moving across the sky. "There are too many images for us to search through by ourselves," NASA said. In this case, people are better than computers at spotting and identifying objects, such as a planet, in the footage. Human eyes can easily recognize the important moving objects while ignoring the background stars and other objects that computer programs would flag. If an average citizen spots something that leads to a discovery, he or she will get shared credit with the professional astronomers. ...The new objects they have submitted to the Minor Planet Center for designation include 2014 SR349, which adds to the class of the rare extreme trans-Neptunian objects. It exhibits similar orbital characteristics to the previously known extreme bodies whose positions and movements led Sheppard and Trujillo to initially propose the influence of Planet X. Another new extreme object they found, 2013 FT28, has some characteristics similar to the other extreme objects but also some differences. The orbit of an object is defined by six parameters. The clustering of several of these parameters is the main argument for a ninth planet to exist in the outer solar system. 2013 FT28 shows similar clustering in some of these parameters (its semi-major axis, eccentricity, inclination, and argument of perihelion angle, for angle enthusiasts out there) but one of these parameters, an angle called the longitude of perihelion, is different from that of the other extreme objects, which makes that particular clustering trend less strong. Another discovery, 2014 FE72, is the first distant Oort Cloud object found with an orbit entirely beyond Neptune. It has an orbit that takes the object so far away from the Sun (some 3000 times farther than Earth) that it is likely being influenced by forces of gravity from beyond our Solar System such as other stars and the galactic tide. It is the first object observed at such a large distance. Planet Nine—the undiscovered planet at the edge of the Solar System that was predicted by the work of Caltech's Konstantin Batygin and Mike Brown in January 2016—appears to be responsible for the unusual tilt of the sun, according to a new study. All of the planets orbit in a flat plane with respect to the sun, roughly within a couple degrees of each other. That plane, however, rotates at a six-degree tilt with respect to the sun—giving the appearance that the sun itself is cocked off at an angle. Until now, no one had found a compelling explanation to produce such an effect. "It's such a deep-rooted mystery and so difficult to explain that people just don't talk about it," says Brown, the Richard and Barbara Rosenberg Professor of Planetary Astronomy. Brown and Batygin's discovery of evidence that the sun is orbited by an as-yet-unseen planet—that is about 10 times the size of Earth with an orbit that is about 20 times farther from the sun on average than Neptune's—changes the physics. Planet Nine, based on their calculations, appears to orbit at about 30 degrees off from the other planets' orbital plane—in the process, influencing the orbit of a large population of objects in the Kuiper Belt, which is how Brown and Batygin came to suspect a planet existed there in the first place. "It continues to amaze us; every time we look carefully we continue to find that Planet Nine explains something about the solar system that had long been a mystery," says Batygin, an assistant professor of planetary science. ... In their paper, "Corralling a Distant Planet with Extreme Resonant Kuiper Belt Objects," Malhotra and her co-authors, Kathryn Volk and Xianyu Wang, point out peculiarities of the orbits of the extreme KBOs that went unnoticed until now: they found that the orbital period ratios of these objects are close to ratios of small whole numbers. An example of this would be one KBO traveling around the Sun once while another takes twice as long, or three times as long, or four times as long etc., but not, say, 2.7 times as long. The findings bolster previous work by other scientists that showed that six of those bodies travel on highly eccentric orbits whose long axes all point in the same direction. This clustering of orbital parameters of the most distant KBOs suggested a large, planetary size body shepherding their orbits. "Our paper provides more specific estimates for the mass and orbit that this planet would have, and, more importantly, constraints on its current position within its orbit," Malhotra said. The team's calculations also suggest two likely orbital planes for the planet: one moderately close to the mean plane of the solar system and near the mean plane of the four eKBOs at about 18 degrees, and one steeper plane, inclined at about 48 degrees. The four longest period Kuiper Belt objects have orbital periods close to integer ratios with each other. A hypothetical planet with an orbital period of ~17,117 years and a semimajor axis ~665 au would have N/1 and N/2 period ratios with these four objects. The orbital geometries and dynamics of resonant orbits constrain the orbital plane, the orbital eccentricity, and the mass of such a planet as well as its current location in its orbital path. In their paper, the team members describe the discovery of the two new objects, and how these two new objects have very distant perihelia but don't have extreme semi-major axes or eccentricities like the other high-perihelion extreme trans-Neptunian objects (TNOs) such as Sedna and 2012 VP113. In fact, these newly found worlds occupy a region of space just beyond what is known as the "Kuiper Belt edge," which lies about 50 AU from the Sun. Until this most recent discovery, only one object was known to have a low-to-moderate semi-major axis and a perihelion beyond this edge. The team discovered several more of these objects with high perihelion but moderately eccentric orbits. Their semi-major axes are in the range of about 60 to 100 AUs. What was surprising is that these new objects are all near Neptune Mean Motion Resonances (that is, the locations of their orbits have specific period ratios with respect to that of Neptune). One of the new objects goes around the Sun once every time Neptune goes around 4 times, while the other new objects go around once every time Neptune goes around 3 times. The new objects also have significant inclinations in their orbits and thus are affected by the Kozai resonance, which was first shown to affect high inclination objects by Yoshihide Kozai in 1962. This finding suggests these worlds were captured into this rare orbital region through interactions with Neptune while that planet was migrating outwards in the solar system in the distant past. Neptune was born much closer to the Sun than its current position, and its migration outwards disturbed other, smaller objects into these distant orbits we see today. Thus, these objects give us insights into the movement of Neptune during the very early history of the solar system. ... Whatever the cause of Niku's strange orbit (or those TNOs that share its orbital pattern) may be, it is clear that there is more going on in the outer solar system than we thought. And with every new discovery, and every new object catalogued by astronomers, we are bettering our understanding of the dynamics that are at work out there. Is Planet Nine a Rogue Planet? Researchers testing whether a much-mythologized object called Planet Nine might indeed be a captured rogue planet found it certainly looks like one. They also performed simulations of various different kinds of rogue encounters with our solar system; they found that if the rogue had a mass equal to or greater than that of Jupiter, it could subsequently leave a physical impact on the configuration of the entire system. James Vesper of New Mexico State University presented the research Friday at the 229th American Astronomical Science meeting in Grapevine, Texas. ... An unknown, unseen "planetary mass object" may lurk in the outer reaches of our solar system, according to new research on the orbits of minor planets to be published in the Astronomical Journal. This object would be different from—and much closer than—the so-called Planet Nine, a planet whose existence yet awaits confirmation. In the paper, Kat Volk and Renu Malhotra of the University of Arizona's Lunar and Planetary Laboratory, or LPL, present compelling evidence of a yet-to-be- discovered planetary body with a mass somewhere between that of Mars and Earth. The mysterious mass, the authors show, has given away its presence—for now—only by controlling the orbital planes of a population of space rocks known as Kuiper Belt objects, or KBOs, in the icy outskirts of the solar system. While most KBOs—debris left over from the formation of the solar system—orbit the sun with orbital tilts (inclinations) that average out to what planetary scientists call the invariable plane of the solar system, the most distant of the Kuiper Belt's objects do not. Their average plane, Volk and Malhotra discovered, is tilted away from the invariable plane by about eight degrees. In other words, something unknown is warping the average orbital plane of the outer solar system. ... A possible alternative to an unseen object that could have ruffled the plane of outer Kuiper Belt objects could be a star that buzzed the solar system in recent (by astronomical standards) history, the authors said. "A passing star would draw all the 'spinning tops' in one direction," Malhotra said. "Once the star is gone, all the KBOs will go back to precessing around their previous plane. That would have required an extremely close passage at about 100 AU, and the warp would be erased within 10 million years, so we don't consider this a likely scenario." Astronomers announced in 2016 that a Planet 9 might exist. Their theory was based on the way some trans-Neptunian objects (TNOs behave. First, the researchers established a version of Planet 9 that would most likely cause our solar system to look the way it currently does, by preventing the TNOs from being destroyed or thrown out of the solar system. Second, the simulations predict that there is a process that they call resonance hopping by which a TNO jumps between stable orbits. This process can prevent the TNOs from being ejected from the solar system. There are now five different lines of observational evidence pointing to the existence of Planet 9. If you were to remove this explanation and imagine Planet 9 does not exist, then you generate more problems than you solve. All of a sudden, you have five different puzzles, and you must come up with five different theories to explain them. … it is now harder to imagine our solar system without a Planet 9 than with one. Dwarf star Gliese 710, which we've known about for some time, could now arrive in 1.29 million years, instead of the previously calculated 1.36 million years. Berski and Dybczyński found that Gliese 710 would enter the Oort cloud to pass by the Sun a distance of about 13,365 astronomical units (each astronomical unit is the distance between Earth and the Sun). According to the new research, it will graze us at a distance of 4,303 AU. That's not actually very close - it's over 100 times the distance to Pluto, which orbits the Sun at an average of 39.5 AU. But it still has the potential to disrupt the Solar System. That'll put it 24 light days, or 400 billion miles, away from us, 4,300 times farther from Earth than the sun. But that's close enough to have an impact. At that time, Gliese 710 will shine three times brighter than Mars. More importantly, its gravity could shoot comets and frozen planet into our solar system, putting them on a potential collision course with Earth. (1 light year) in the next 1,000,000 years, close enough to have an impact on our solar system. And there are many trajectories yet to be measured. Calculations show the systems are massive enough to give the Oort Cloud a good stir. 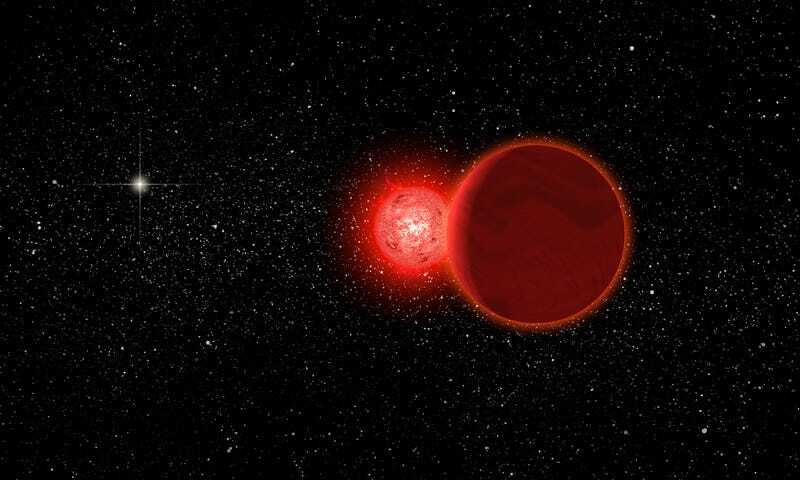 Around the same time our ancestors left Africa, a dim red dwarf star came to within 0.8 light-years of our Sun, marking the closest known flyby of a star to our Solar System. New research suggests Scholz’s Star, as it’s known, left traces of this interstellar encounter by perturbing some comets in the outer Oort Cloud. Though Scholz’s Star visited the outer reaches of our Solar System some 70,000 years ago, awareness of this celestial meet-and-greet first emerged three years ago in a study published in the Astrophysical Journal Letters. According to this research, a dim red dwarf star, along with its even dimmer brown dwarf companion—a kind of bloated gas giant that failed to ignite into a full-blown star—came to within 0.8 light-years of our Sun (4.7 trillion miles, or 50,600 AU, where 1 AU is the average distance of the Earth to the Sun), and possibly as close as 0.6 light-years (3.53 trillion miles, or 37,900 AU). That’s a close shave, at least by cosmological standards. By comparison, MU69, a Kuiper Belt object that will be visited by the New Horizons spacecraft on New Year’s Day 2019, is about 43 AU from the Sun. Astronomers found a strange dwarf world that provides even more evidence that a giant planet is lurking at the edge of our solar system. ... observations suggests the gravitational influence of another planet is altering the distant objects' orbits. Now additional findings of a newly discovered planetary object with an odd orbit support the case for an undiscovered Planet Nine. The new object, called 2015 BP519, takes an elliptical journey around the Sun spanning from 35 to 862 times the radius of Earth’s own orbit. 2015 BP519 orbits at a 54 degree angle compared to nearly everything in the inner solar system, and the theory is that Planet Nine is responsible. The tiny rock — eloquently named TG387 and nicknamed “The Goblin” — was spotted by astronomers at the Carnegie Institution of Science using a giant Japanese observatory in Hawaii called Subaru. Right now, there are 14 far-out space rocks that all share similar orbit patterns, suggesting that this planet is out there. Their paths are all super elongated, and they all cluster together in the same area when they approach the Sun. Plus, their orbits are all tilted alike, and they point in the same general direction, as if something big has pushed them into similar places. These objects are the strongest lines of evidence astronomers have for Planet X, and finding a new one that matches this pattern reinforces that idea that this planet is more than just a theory. ... Technosignatures are signs or signals, which if observed, would allow us to infer the existence of technological life elsewhere in the universe. The best known technosignature are radio signals, but there are many others that have not been explored fully. In April 2018, new interest arose in Congress for NASA to begin supporting the scientific search for technosignatures as part of the agency's search for life. As part of that effort, the agency is hosting the NASA Technosignatures Workshop in Houston on Sept. 26-28, 2018, with the purpose of assessing the current state of the field, the most promising avenues of research in technosignatures and where investments could be made to advance the science. 73 exoplanetary host stars sorted by distance from our Sun. Spectral types are indicated by the color key at lower right. The inner circle has a radius of 5 parsecs, and each successive ring represents an increment of 5 parsecs. ... The new research suggests that the rings are recent and temporary. Like some previous studies, it suggests a much younger age for the rings than 4 1/2 billion years. The new research indicates that they are unlikely to be older than 100 million years. Research suggests an even shorter timeframe for the rings survival, giving them less than 100 million years to live. Maybe it played at part in the extinction of the dinosaurs. Ice and dust particles from Saturns ring...i don´t see how. Let's look at it backwards. 65 million years ago a 6 mile chuck whacked the Yucatan and that was an E.L.E. for the dominant species, dinosaurs. That chunk came from somewhere. The dinosaur killer might have arrived from the main asteroid belt, though NOT from the Baptistina asteroid family. Ejection from the asteroid belt is thought to normally take many tens of millions of years. Resonances are areas in the main belt where gravity nudges from Jupiter and Saturn can act like a pinball machine to fling asteroids out of the main belt and into the region near Earth from time to time. Here's my hypothesis with a couple of cognitive leaps thrown in. Based on the the recent article, Saturn didn't have rings prior to 100 (+/- 20) million years ago. So where did 3 × 10^19 kg of ice and dust come from? 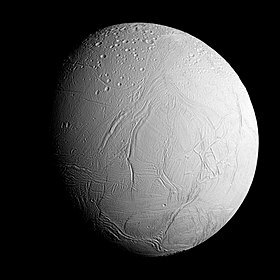 Enceladus is about 500 kilometers (310 mi) in diameter - mass = 1.1×10^20. Second; to end up with 1.0-1.5 x 10^20 kg of rock and ice particles (~ mass of Enceladus) we would need to slam 2 objects with ~ mass of Enceladus together with enough force such that both are pulverized and have enough deltaV to avoid reconstituting into another moon. Because ~ 1/3 of the debris of the resulting collision will be aimed (down) at Saturn's gravity well and fall onto the planet; 1/3 of the debris will retain the orbital path of the original moon; and 1/3 of the debris the will be aimed away (up) from Saturn and leave the system. That leaves a lot of debris that has the potential to make it's way sun-ward (toward Earth), even if 99.99999% of it is not heading in our general direction. So maybe one of those chucks had our name on it and, after 20-40 million years, it fell into Earth's gravity well. The rest is history. Or not. Fair enough although i don´t think there is a way to prove or disprove the hypothesis or my rival one that it was just a rock from space. History will be made on Tuesday when Nasa's New Horizons probe sweeps past the icy world known as Ultima Thule. 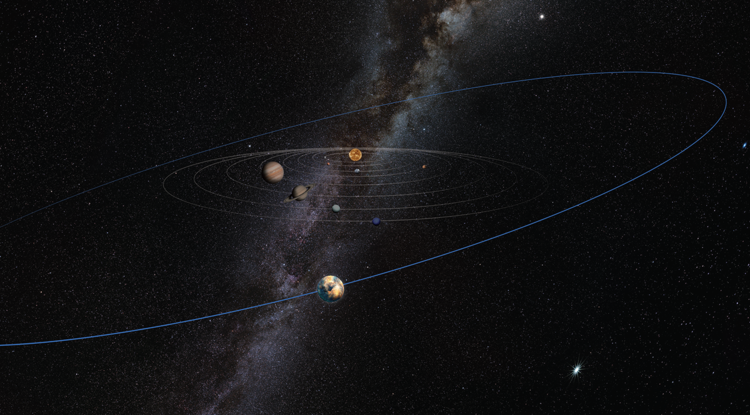 Occurring some 6.5 billion km (4 billion miles) from Earth, the flyby will set a new record for the most distant ever exploration of a Solar System object by a spacecraft. Just like with the Pluto flyby, the New Horizons mission team is gathered at John Hopkins University’s Applied Physics Laboratory in Laurel, Maryland, where they will monitor the spacecraft from the facility’s mission operations center. New Horizons won’t send a signal back to Earth until a few hours after it whizzes past the rock, called Ultima Thule. So sometime between 9:45 and 10:45AM ET, January 1, the mission team should receive that signal confirming a success. The US space agency's New Horizons probe has made contact with Earth to confirm its successful flyby of the icy world known as Ultima Thule. The encounter occurred some 6.5bn km (4bn miles) away, making it the most distant ever exploration of an object in our Solar System. New Horizons acquired gigabytes of photos and other observations during the pass. It will now send these home over the coming months. Images taken during the spacecraft's approach — which brought New Horizons to within just 2,200 miles (3,500 kilometers) of Ultima at 12:33 a.m. EST — revealed that the Kuiper Belt object may have a shape similar to a bowling pin, spinning end over end, with dimensions of approximately 20 by 10 miles (32 by 16 kilometers). Flyby data have already solved one of Ultima's mysteries, showing that the Kuiper Belt object is spinning like a propeller with the axis pointing approximately toward New Horizons. This explains why, in earlier images taken before Ultima was resolved, its brightness didn't appear to vary as it rotated. Hi-res images will be downloaded over the next 20 month's. The new images — taken from as close as 17,000 miles (27,000 kilometers) on approach — revealed Ultima Thule as a "contact binary," consisting of two connected spheres. End to end, the world measures 19 miles (31 kilometers) in length. The team has dubbed the larger sphere "Ultima" (12 miles/19 kilometers across) and the smaller sphere "Thule" (9 miles/14 kilometers across). Eugene Bagashov on Oumuamua, it's curious trajectory amongst other things. “So he goes to another sonar machine and confirmed it wasn’t a machine anomaly - it was real. I thought ‘Wow that is incredible’. Four years later Marc said he was doing some more contract work for the Navy when he spoke to a senior naval figure about what he saw. “I asked him ‘Can you tell me about the Fast Mover Programme?'" Marc explained. “He looked at me and said 'Sorry Marc I can’t talk about that programme'. “So he basically confirmed to me that the programme exists - he said everything without seeing anything. New research suggests that in the near future giant telescopes like the Webb might be replaced (or at least augmented) by swarms of tiny spacecraft working in concert. ... As documented in a paper published today in Optica, the team leapfrogs existing methods in an interesting way. Two satellites move in synchrony around the edge of a circle, collecting data as they go and beaming it to a third stationary one; this circle describes the synthetic aperture the two cameras are creating. In other words, they were basically able to get the results of a camera 50 times the size. That would be impressive anywhere, but up in space it’s especially important. Using data from NASA's Kepler space telescope, citizen scientists have discovered a planet roughly twice the size of Earth located within its star's habitable zone, the range of orbital distances where liquid water may exist on the planet's surface. The new world, known as K2-288Bb, could be rocky or could be a gas-rich planet similar to Neptune. Its size is rare among exoplanets—planets beyond our solar system. 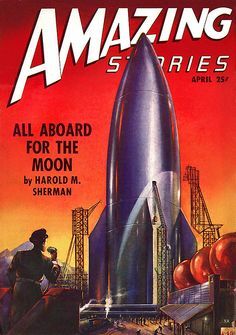 Musk noted that the final rocket has a pointier tip................................................... 1947 ... all aboard! Interesting read on Venus, nice animations too. Despite the progress that has been made in studying these features, the scientific community remains divided into two camps when it comes to what causes Martian slope streaks. Those who belong to the "wet" mechanism school of thought believe that liquid water could be responsible for their creation, possibly as a result of groundwater springs, melting surface ice, or the formation of brines (salt solutions). In contrast, those who fall into the "dry" mechanism school theorize that dust avalanches are responsible. These, in turn, could be caused by air fall deposits, subsurface melting, or localized disturbances – ranging by rockfalls, meteorite impacts, or tectonic activity ("marsquakes"). Both of these explanations have limitations when it comes to explaining observed slope streaks. Using a terrestrial analog from Bolivia, a research team from Sweden recently conducted a study that explored the mechanisms for streak formation and suggest that wet mechanisms appear to account for more, which could have serious implications for future missions to Mars. The subject of what causes these streaks and other transient surface features is important for many reasons, not the least of which has to do with planetary protection. In Sept. 2016, the Curiosity rover encountered dark streaks while driving along the sloping terrain of Mount Sharp, which required that it alter its path to avoid contact and possible contamination of the site. This decision was based on the possibility that subsurface water was responsible for the streak, and could be an indication of subsurface life. If slope streaks are indeed linked to seasonal water flows, then we proper measures will need to be put in place for future missions, especially crewed ones. DF2 is strange, even for a dwarf galaxy. For starts, it’s ultra-diffuse, with no central core, no spiral arms, and no beehive-like elliptical structure. An instrument like Dragonfly is optimized for finding structures like this one with such low surface brightnesses; DF2 is one of only three or four known ultra-diffuse galaxies. It looks like a puffed-up ball of stars, and nothing more. It is surrounded by a halo that’s populated with globular clusters, except its globular clusters are weird: they’re twice as large as the globulars we see in other galaxies. They’re also old: at least 9 billion years have passed since new stars have formed in them. But the strangest thing of all is that the motions of the stars inside of it, as well as the motions of the globular clusters around it, are so small. If dark matter were abundant, they’d move around at speeds of ±30 km/s, give or take a little. But that’s not what we see at all. The stars and the globular clusters aren’t moving at ±16 km/s, as the prior team indicated, but at a mere ±7-or-8 km/s. By measuring the stars directly, they found a stellar velocity dispersion of ±8.4 km/s, while the globular clusters gave a slightly lower value of ±7.8 km/s. These values are consistent with what you’d expect from the mass of stars inside the galaxy alone; there appears to be no dark matter present inside this galaxy at all. The globular clusters are found farther out than the stars by about a factor of 4, which is where the effects of a dark matter halo should be more significant. The fact that the the velocity dispersion remains unchanged between the stars and globular clusters, at least to the best resolution of our instruments, indicates that this galaxy may be the first example of a new population whose existence was predicted by theory: of ultra-diffuse, dark-matter-free galaxies. CEO Elon Musk said in a tweet Wednesday that winds of 50 miles per hour "broke the mooring blocks late last night" and blew over the rocket's "fairing" – the large nosecone at the top of the rocket. The damage "will take a few weeks to repair," Musk added. A ball peen hammer and a little Bondo®, and she'll be right as rain. Havana, Cuba (CNN) A meteor broke apart over western Cuba on Friday, hurtling numerous pieces of various sizes to the ground in several towns in Pinar del Rio province, the state-run Granma newspaper reported. One meteorite landed with a "loud explosion" in the town of Viñales, Granma said. Researchers from several Cuban agencies, including the Institute of Geophysics and Astronomy, confirmed the meteorite strikes, Granma reported. radar may have detected the meteor that affected western Cuba earlier today. At 121 pm, a signature was detected near Viñales, Cuba, at a height of over 26,000 ft above ground level. ... According to new data posted by the NASA Jet Propulsion Laboratory’s Center for Near Earth Object Studies and flagged by CNET, the object’s collision with the atmosphere released the energy of around 1.4 kilotons (1,400 tons) of TNT. the detonation over Cuba was one of the more notable fireballs since the meteor that hit Chelyabinsk, Russia near the nation’s border with Kazakhstan in 2013. Scientists say that explosion detonated with the force of over 470 kilotons of TNT, or nearly as strong as the MK-18 “Ivy King” in 1952, the largest pure-fission bomb ever tested by the U.S. at 500 kilotons. According to a Tulane University fact sheet, the Chelyabinsk object was probably around 56-65 feet (17-20 meters) in diameter. The object that exploded over Cuba was likely much smaller, probably around the size of a van. Only minor property damage such as shattered windows—probably from the sonic boom generated by the object surpassing the speed of sound—was reported to have resulted, with no injuries. His follows the finding, announced in November 2018, of a 19-mile-wide crater beneath Hiawatha Glacier - the first meteorite impact crater ever discovered under Earth's ice sheets. Though the newly found impact sites in northwest Greenland are only 114 miles apart, at present they do not appear to have formed at the same time. If the second crater, which has a width of over 22 miles, is ultimately confirmed as the result of a meteorite impact, it will be the 22nd largest impact crater found on Earth. ... Following the finding of that first crater, MacGregor checked topographic maps of the rock beneath Greenland's ice for signs of other craters. Using imagery of the ice surface from the Moderate Resolution Imaging Spectroradiometer instruments aboard NASA's Terra and Aqua satellites, he soon noticed a circular pattern some 114 miles to the southeast of Hiawatha Glacier. The same circular pattern also showed up in ArcticDEM, a high-resolution digital elevation model of the entire Arctic derived from commercial satellite imagery. To confirm his suspicion about the possible presence of a second impact crater, MacGregor studied the raw radar images that are used to map the topography of the bedrock beneath the ice, including those collected by NASA's Operation IceBridge. What he saw under the ice were several distinctive features of a complex impact crater: a flat, bowl-shaped depression in the bedrock that was surrounded by an elevated rim and centrally located peaks, which form when the crater floor equilibrates post-impact. Though the structure isn't as clearly circular as the Hiawatha crater, MacGregor estimated the second crater's diameter at 22.7 miles. Measurements from Operation IceBridge also revealed a negative gravity anomaly over the area, which is characteristic of impact craters. "The only other circular structure that might approach this size would be a collapsed volcanic caldera," MacGregor said. "But the areas of known volcanic activity in Greenland are several hundred miles away. Also, a volcano should have a clear positive magnetic anomaly, and we don't see that at all." Although the newly found impact craters in northwest Greenland are only 114 miles apart, they do not appear to have been formed at the same time. From the same radar data and ice cores that had been collected nearby, MacGregor and his colleagues determined that the ice in the area was at least 79,000 years old. The layers of ice were smooth, suggesting the ice hadn't been strongly disturbed during that time. This meant that either the impact happened more than 79,000 years ago or -- if it took place more recently -- any impact-disturbed ice had long ago flowed out of the area and been replaced by ice from farther inland. Open Access: Joseph A. MacGregor et al. A Possible Second Large Subglacial Impact Crater in Northwest Greenland, Geophysical Research Letters (2019). Strange celestial structures that look like dust clouds but act like stars may have been created by the supermassive black hole at the center of the Milky Way, according to unpublished research set to be presented at the American Astronomical Society. Scientists have spent a lot of time studying the odd bodies -- known as G-objects -- in order to figure out how they operate. In the recent analysis, researchers from the University of California, Los Angeles discovered three additions to the class and may have shed light on how the odd objects first formed. Scientists first noticed two of the objects in 2004 and 2012. Further study revealed the bodies, which produce red light and appear to be quite cool, are likely surrounded by dust. However, the first two G-objects have wandered near the Milky Way's supermassive black hole without being torn apart. As a result, they have to be denser than a dust cloud. That property is why scientists believe they are actually stars surrounded by gas. "They're weird because they are not gas nebulae, they're not stars, so we think they're something in the middle, a stellar object surrounded by gas and dust," study author Anna Ciurlo, an astronomer at the University of California Los Angeles, told Newsweek, "like a star that's been puffed up." As the objects sit so close to the black hole, astronomers also believe that is where they came from. Previous research suggests black holes can encourage closely-paired stars to collide more quickly than they would normally. It is possible such collisions create G-objects. A interesting new class of objects. ... According to the reconstruction made by the Colombian astronomers, the object producing the meteor over Cuba starts its trajectory inside the atmosphere at an altitude of about 76.5 km above the caribean sea, over a point 26 km to the southwest of the San Felipe Keys (Cuba). The speed of the rock at its contact with the atmosphere was 18 km/s (64,800 km/h). With such a velocity, the thin air of the high atmosphere was not enough to stop the object, although it was enough to heat it until the rock became bright. The rock continued its path in an almost straight line until a height of around 27.5 km. It was at about that altitude that the smoke trail, observed by thousands in Cuba and in satellite images, started to develop. Zuluaga and coauthors estimate that the cloud seen in Pinar del Rio corresponds to a small part of the trajectory of the meteor (corresponding to altitudes between 26 and 22.5 km). According to the footage on that city and the reconstruction of the Colombians, the airburst ended at about 22 km. After reconstructing the trajectory in the atmosphere, the Colombian astronomers played back the impact and found that the culprit, a rock with an estimated size of several meters and a weight of about 360 tons, came from an eccentric orbit around the sun with an average distance of 1.3 astronomical units (1 astronomical-unit = 150 million km). Before impacting the Earth, the rock completed a turn around the sun every 1.32 years. All that came to an end on February 1, 2019, when the rock and the Earth found themselves at the same point in space at the same time. ... "We should be prepared for the next projectile." The method the researchers use is pretty interesting. In GRT, the Earth is not hit by asteroids but it is a source of them. Many rocks are launched (in a simulated environment) into thousands of directions in the sky and with different speeds, from a certain geographical location (a beach in the northwest of Cuba or a valley on the moon). The rocks that end up in orbits around the sun, similar to already discovered asteroids, are flagged as potential impactors. The rocks with orbits that are not typical of near-Earth objects (NEOs) are flagged as unnatural objects. Tunguska and Chelyabinsk impact events occurred inside a geographical area of only 3.4 per cent of the Earth's surface. Although two events hardly constitute a statistically significant demonstration of a geographical pattern of impacts, their spatial coincidence is at least tantalizing. To understand if this concurrence reflects an underlying geographical and/or temporal pattern, we must aim at predicting the spatio-temporal distribution of meteoroid impacts on Earth. For this purpose we designed, implemented, and tested a novel numerical technique, the ‘Gravitational Ray Tracing’ (GRT) designed to compute the relative impact probability (RIP) on the surface of any planet. Locations at 60–90° from the apex are more prone to impacts, especially at midnight. Counterintuitively, sites close to apex direction have the lowest RIP, while in the antapex RIP are slightly larger than average. We present here preliminary maps of RIP at the time of Tunguska and Chelyabinsk events and found no evidence of a spatial or temporal pattern, suggesting that their coincidence was fortuitous. A San Diego State University astrophysicist has helped discover evidence of a gigantic remnant surrounding an exploding star--a shell of material so huge, it must have been erupting on a regular basis for millions of years. When a white dwarf, the core of a dead star, is in a close orbit with another star, it pulls gas from the other star. The gas becomes heated and compressed, eventually exploding to create a nova. This explosion causes the star to brighten by a millionfold and eject material at thousands of miles per second. The ejected material forms a remnant or shell surrounding the nova. Allen Shafter and former SDSU postdoc. Martin Henze, along with a team of astrophysicists led by Matthew Darnley at Liverpool John Moores University in England, have been studying a nova in the nearby Andromeda galaxy known as M31N 2008-12a. What makes the nova unusual is that it erupts far more frequently than any other known nova system. "When we first discovered that M31N 2008-12a erupted every year, we were very surprised," said Shafter. A more typical pattern is about every 10 years. Type Ia supernovae are among the most powerful and luminous objects in the universe and are believed to occur when a white dwarf exceeds its maximum allowable mass. At that point, the entire white dwarf is blown apart instead of experiencing explosions on the surface as other novae do. These are relatively rare and unseen in our own galaxy since the early 1600s. Theoretical models show that novae experiencing frequent explosions surrounded by large remnants must harbor massive white dwarfs that are nearing their limit. This means M31N 2008-12a is behaving precisely the way astronomers believe a nova does before it potentially explodes as a supernova. So there is a thin line between being blown apart and blowing huge bubbles. The donor star must be huge and the process gradual enough to not cross that line. Wouldn't want to get closer than 100 light-years of that puppy when it blows.